Come away to the water. My apartment building has a pool on the ground floor. This strikes me as strange because most apartment buildings have pools tucked away somewhere in the middle of the building. Not on the ground floor in full view of the lobby. Needless to say, in the 2 years that I’ve lived in the building I have never gone for a swim in the pool. It’s enough that I get ogled on the street for being a “foreigner”, people’s stares making me feel a bit like a gazelle in the wild. Fully clothed the staring is quite uncomfortable – I can’t imagine what it would be like if I put on a bikini. So I have no plans of actually using the pool – but I have, on many nights, brought out some tea or chocolate vodka and sat by the edge, feet in the water, stargazing, thinking of nothing or sometimes of everything. The pool became my pool. My quiet place where I could turn off my brain and just be. The last time I hung out at my pool was in July I think. I was with a boy I secretly liked. We had one of those weird, difficult conversations where it became clear that my liking him wasn’t that much of a secret and that he only saw me as a friend. I of course, denied liking him even if it was painfully obvious that I did. I had my pride to think of after all. It’s one of the few times I outright lied about something and it still bothers me that I wasn’t able to be honest with him. Since that night, I haven’t been able to visit my pool. It had become our pool you see and I couldn’t go back there without him – it made my chest hurt. Isn’t it strange how one painful experience can overwrite months of good memories? Last night I finally returned to my pool. It was a bit like visiting a friend that you haven’t seen in a long time – and you feel like that person has become a stranger to you. I rolled up my leggings, stuck my feet in the cold water, leaned back on my hands, and looked up at the stars. I moved my feet under the water and watched the ripples form. And when it got cold I pulled my legs out to dry and watched the glassy surface of the pool as it grew still. There’s something supremely calming about watching still water. It helps me clear my mind of all the noise and clutter I’ve collected during the day. 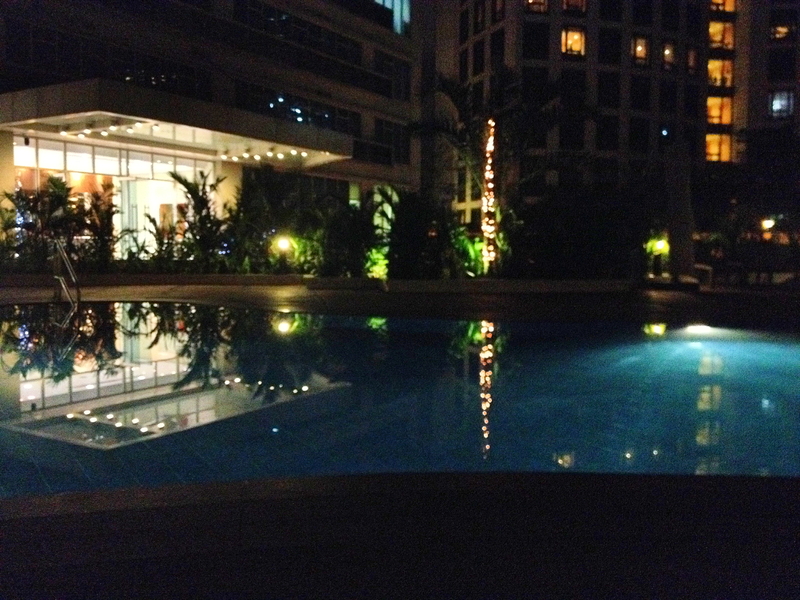 I sat there, watching the reflection of the lights, the buildings, the potted plants around the pool. I heard the wind rustle through the trees, the honking of the occasional passing car. I sat there, listening, watching, silently thinking. I thought about the bad day I had at work. About this new boy that I was seeing and how to tell him that I didn’t think this was working out. About giving him more time to change my opinion of the situation. I thought about the old boy – the one I shared my pool with. Wished I could rewind to that night and stuff the words I said back down my throat. I miss the friendship. Everyone says that and it sounds so cliché and quite frankly I know it sounds untrue. But it is true. I miss talking about nothing in particular for hours on end drinking tea, or wine, or chocolate vodka. I see him around occasionally and my chest doesn’t tighten up anymore. I look at him and think “man, I wish we could hang out tonight. I wish we could just hang out by the pool”. And I think, what a waste of a perfectly good friendship. I’m thinking about all this as I sit by my pool and realizing it doesn’t matter. There’ll be another friend to talk about nothing and everything and the things in between. But I’m probably not going to bring him to my pool for a while. After all, I just got it back.